I won’t be going to any beach resorts this year (unfortunately), but that doesn’t mean I can’t dream. This frosty summery beverage is a classic poolside sip, usually made with rum. I stuck to making a virgin version – something the kids can enjoy too. 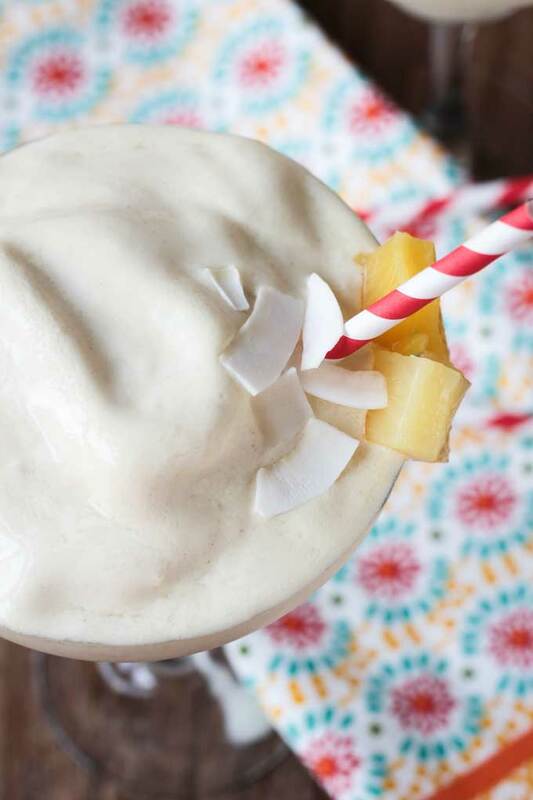 Get out the slip-n-slide for the kids, a lounge chair for yourself and a pitcher of this Pineapple Coconut Smoothie. Who needs a resort when you’ve got this?! 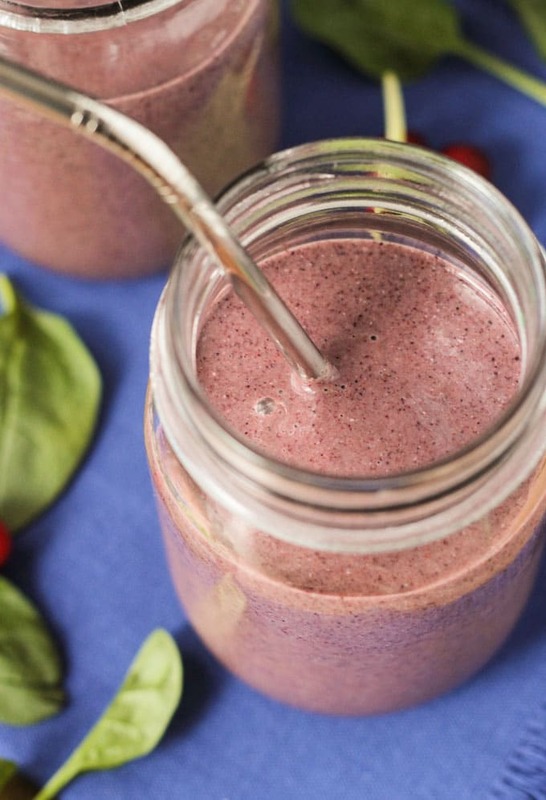 This quick and easy smoothie needs only 3 ingredients with an optional 4th. It’s important, though, to use frozen fruits. I always have bags of store-bought frozen fruit in my freezer for situations such as this. And I purposely buy more bananas each week than I know we will eat fresh so I can freeze the leftovers when they turn brown. Simply peel the over-ripe bananas, slice them and lay the slices on a plate or baking sheet in one even layer. Stick the plate or baking sheet into the freezer. Once the banana slices are frozen, you can transfer them to a freezer bag for easier storage. Ok, so, you could totally use fresh fruits and it would still be super yummy; it just won’t be the frozen beach drink of your dreams. Or not. Your choice. 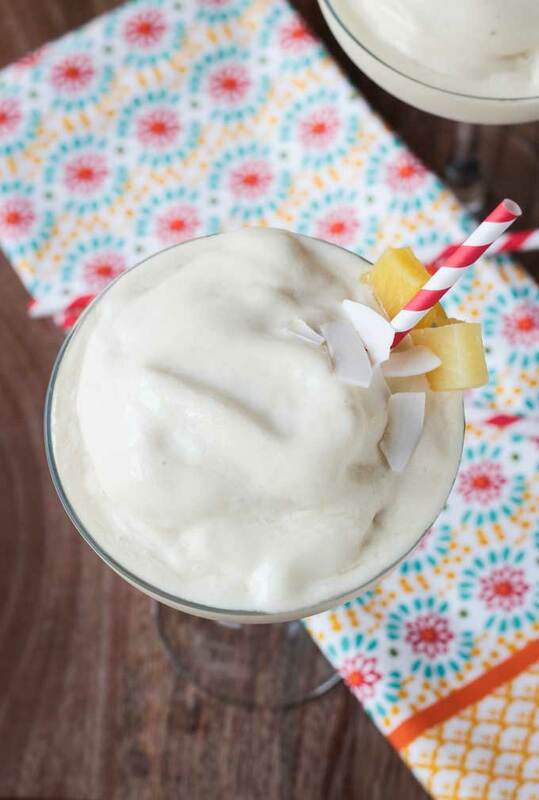 You could totally turn these dairy free smoothies into an adults-only summer treat by adding a shot or two of rum. But, if you do this you should probably make a virgin batch for the kids anyway because they are going to want this refreshing fruity goodness too! So, who’s up for a refreshing summer beverage that will take you back to your favorite beach vacation? I thought so! I’m going to be drinking these ALL summer! 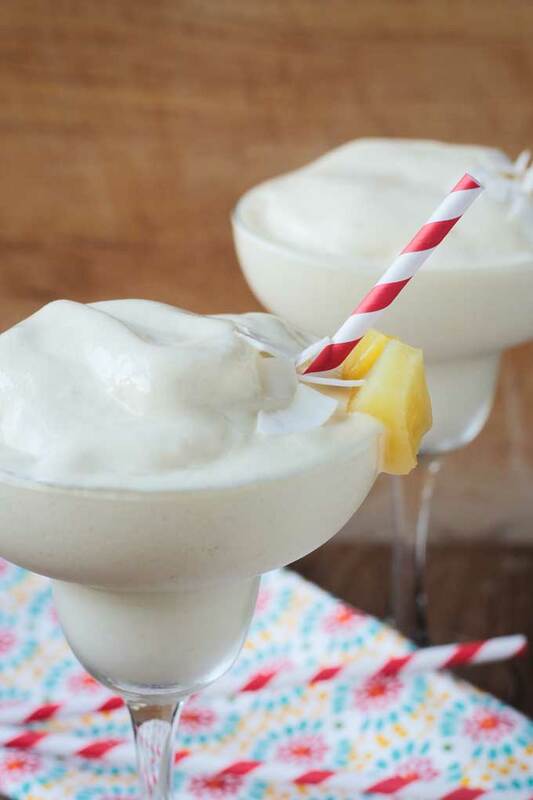 If you make this Pineapple Coconut Smoothie be sure to leave me feedback below. Don’t forget to snap a pic and tag me @veggie_inspired #veggieinspired on Instagram and Twitter. If you love the pineapple-coconut combo, be sure to also check out my Pineapple Coconut Muffins! 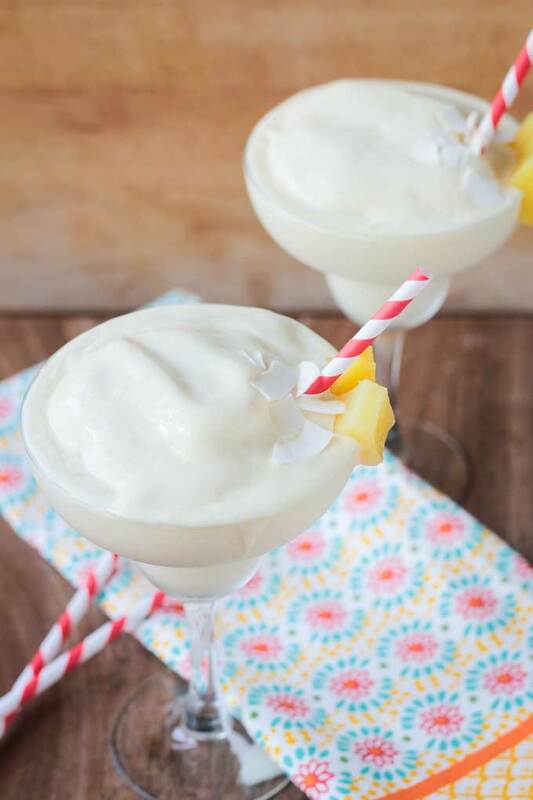 Pineapple Coconut Smoothie – a frozen virgin Piña Colada that will transport you poolside at your favorite resort. And if you want to add some rum, no judgment here – just be sure your kids don’t sneak a sip of yours! Blend all ingredients in a high speed blender until smooth, preferably on the "Frozen" setting if your blender has one*. *I use a Vitamix, which has several convenient settings in addition to the regular speeds. The frozen setting works miracles for smoothies and dairy free ice creams. I’ve used this combination of fruits before and I love it (anything pina colada-esque is good with me! 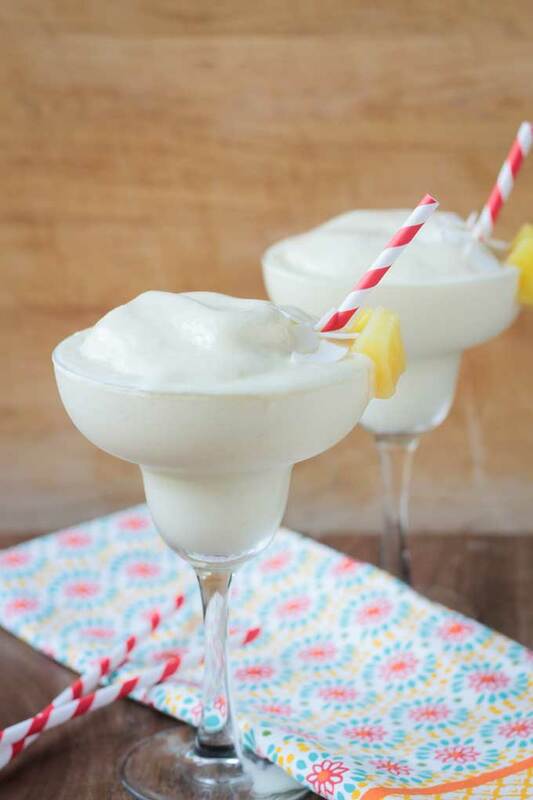 ), but I’ve never frozen the fruit first to make it slushie-like – genius idea! I’m lucky enough to be close enough to beaches, but sadly don’t have a garden big enough to sit in. These sound totally fabulous and I will now be on the lookout for frozen pineapple. You are so lucky to be by so many beaches! We have a very small beach near us, but it’s definitely not like a beach getaway. I hope you love these, Choclette! Thanks! I love that description!! Thanks, Natalie! You will love it! Thank you, Jan! It’s actually a margarita glass, but whatever works, right?! Thanks for stopping by! I think the best smoothies are the tropical ones <3 SOOO good, like really! You can't turn it down! Thank you, Rebecca! I definitely won’t be turing it down – such a perfect refresher for summer. 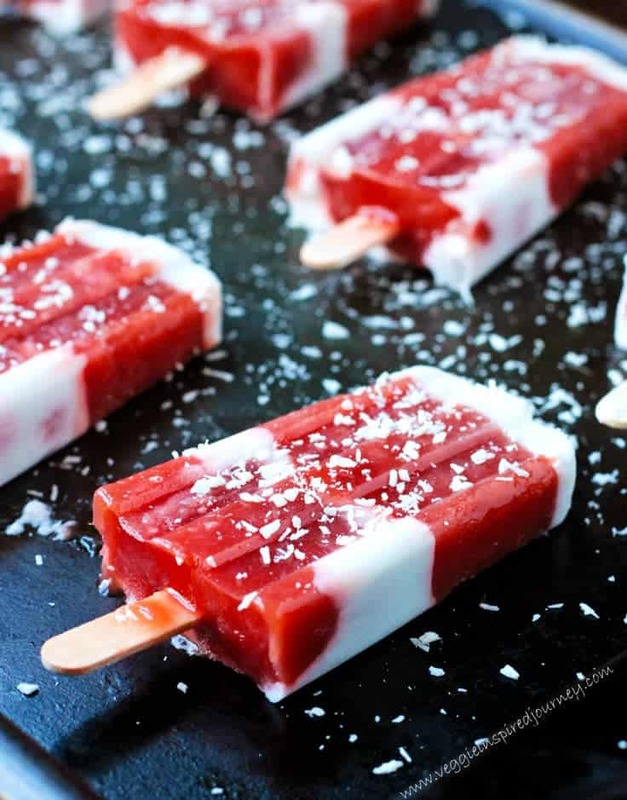 I’m totally making popsicles with them next week!